Ruth Hazeldine – 86, of Brighton England, Liverpool and Wolfville NS and Venice Florida, passed away on Friday, October 14, 2011. She married her loving husband, Eric, in England in 1946. In 1952 they boarded the Queen Mary with three small children and sailed to a new life in Nova Scotia. They purchased a stately old sea captain’s house in Liverpool and Ruth managed this as a B & B, “Dene Manor”, for 20 years. While raising 5 children and running a business, Ruth also had time for community involvement. As a member of the South Shore Tourist Association she was instrumental in getting the “named scenic routes” we see today throughout NS. She was a tireless supporter for the mentally and physically challenged and went on to teach special education for 10 years in Liverpool area schools. During their retirement years, she enjoyed travelling and divided her time between NS, Florida and family. 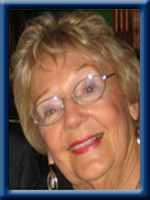 She participated in and led many activities in Kings Gate Club (Florida), always spreading her infectious enthusiasm. Ruth was the ultimate “people person”, cherished wife, adored mother, proud grandmother and great-grandmother. Her positive energy, generous spirit and love of life touched everyone she met. She was a treasured friend to all. She is survived by 5 children, Keith (Ethel), Ponhook Lake NS; Carol (Jim) Dewar, Wolfville NS; Sally (Arnie) Chestnut, Wolfe Island ON; Gail (Bill) Moffatt, Truro NS; and Piers (Wendy), Ponhook Lake NS; 15 grandchildren and 9 great grandchildren. She was predeceased by Eric, her adoring husband of 64 years, sisters Violet and Evelyn and brother Stuart. The joyous celebration of Ruth’s life will be held at 2:00 pm Monday, October 17, in the White Family Funeral Home, Kentville with Reverend Judith Tod officiating. A reception will follow. Donations in memory may be made to the Canadian Cancer Society, NS Division or the Heart and Stroke Foundation of Nova Scotia. The family would like to thank the staff at the Valley Regional Hospital for the wonderful and compassionate care that Ruth received. We were sorry to hear about Ruth. Our thoughts and our prayers are with your family. at the cottage with my parents enjoying my Mother’s Steak & Kidney Pie with a whole crowd there. They really enjoyed that. We were saddened to read of Ruth’s passing. It sure was a pleasure to know Ruth and her beloved husband Eric. She was our son’s teacher and a great great woman, teacher and just a great human being. Take joy in all of the great memories and hold on tightly to them. I remember once when she and the class went skating to Fort Point, then had hot chocolate, it was great, that is only one of the memories that we wanted to share with you! I am so very sorry to hear of Ruth’s passing. She was a lovely lady. I remember when I lived on Bristol Avenue, visiting Dene Manor when it was owned and operated by Eric and Ruth. We played in the yard, climbed the trees and had lots of fun. It seemed like there were always kids there. They were gracious hosts and many people have fond memories of the guest house. Just recently my mom, Rita remarked about what a lovely lady Ruth was and she had a lot of “class” I am sure she will be missed. Piers, Wendy & Hazeldine families — We extend our deepest sympathy to all of you in the loss of your mother. She was a very loving person and will be greatly missed by many. God bless you all. My deepest sympathy to the Hazeldine family. Mrs. Hazeldine was a wonderful lady and will be greatly missed by all those who knew and loved her. I remember as a child how much I enjoyed going to birthday parties at Dene Manor, they were the best! May the family find comfort in each other, in their friends, and in the warm and happy memories of a classy and elegant lady. I was saddened to read of your mother’s passing. She was a very vibrant lady. May you be comforted in knowing how many lives she has touched. Our prayers are with you at this time. I am sorry to hear of the loss of your dear mother and grandmother. Ruth was indeed a lovely lady. I will always remember her bright smile and funny stories when we worked together at the Brooklyn school. The memories you all have will help you through this difficult time. So very sorry of the loss of your Mom .Ruth always had a smile for everbody All of you take care. So sorry to hear of your loss. Your mother as everyone knew was a tremendous lady, pleasant and kind.. I have fond memories of coming to your beautiful home, and Ponhook as well. Thoughts and prayer sent for you all. My condolences to the family. Mrs. Hazeldine was such a classy lady and a loving wife, mother and grandmother. She will be missed ! We were sorry to hear of your Mom’s passing. She was a wonderful teacher to our daughter, Paulette. sorry for your loss. Your mother was a ”real lady” and always had a smile and kind word for everyone. our prayers are with you, and all the families. It seems like eons ago when the late School Inspector C. B. LeGrow, the late District Supervisor Annie Ritchie, the late Anne Jones Thomsen, Ruth and I worked so hard to bring the special education program to South Queens in the 1960’s and 1970’s; one of the few such programs in Nova Scotia at the time. District # 7 School, as part of the Brooklyn System (both have vanished) was the chosen site for the new program. The program was exceptionally successful, and this was due almost entirely to the skillful efforts that Ruth, as the teacher, and her assistant, Anne Thomsen, put forth every day to give these handicapped children a chance to be happy and successful in school. One should remember that before this class opened, these handicapped children did not attend school. This program continued in later years in Brooklyn, and in the 1980’s moved into a specially built state of the art facility in Milton. Ruth’s star will continue to shine in our memories, and we all will miss her greatly. Our condolences to her family. Ruth was a great lady. Please accept our condolences in the loss of your Mum. She certainly was a wonderful person and liked by all. We were talking to her last summer when we met her at a farm market in Kentville. Our thoughts and prayers are with you all at this very difficult time. Dear Hazeldine Family,so sorry to hear the news of your Moms passing. Just a few short weeks ago ,we were kicking up our heals on the Dance floor with her !!! Such a Beautiful person ,always up for a good time.Have lots of fond memories of my childhood playing at Dene Manor.Hold tight to your memories,& find Comfort in friends & each other. Our thoughts & Prayers are with you at this sad time. God Bless. So sorry to hear of the loss of your mom and grandmother. She was a lovely, caring woman who was always so pleasant. I have fond memories of teaching with her at Brooklyn School. My thoughts and prayers are with you during this difficult time. Ruth was larger than life itself, one of those special people of whom it can truthfully be said, it was a joy to know her. She will be fondly remembered with a smile by all her friends, especially those of us who shared our community with her and with your dad. To Piers and the rest of the Hazeldine family I send my sincere condolences. I know Ruth will be sadly missed but fondly remembered by all that knew her. Be strong for each other and find comfort in your fond memories of her. Our thoughts are with you all. A great lady, indeed. Please accept my condolences on Ruth’s passing, such a wonderful neighbour all those years ago. I was always warmly wecomed by Ruth and spent many great times there. She put me to work early helping with all the housekeeping at the Manor. She had a wonderful warm friendly spirit and will surely be missed and fondly remembered. I am so sorry to hear of your mother;s passing,,, my thoughts and prayers are with you and your family..